The MIC partnered with CRS to offer the MAX to Powersports companies. 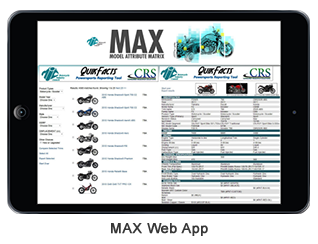 An innovative way to improve product compatibility in the Powersports industry, the MAX is a compilation of motorcycle, scooter, ATV, and ROV/MOHV (side by side) model specifications.The MAX combines MIC-appended data with model attributes provided by CRS. The final result allows Powersports companies to exchange model information and helps to ensure product compatibility. The database includes more than 40 attributes for nearly all Powersports models from leading brands dating back to 2004. Copyright © 2019 Consumer Research Solutions, Inc. All rights reserved.